A curious diagram appeared in the most recent NEJM, in a perspective on U.S. dietary guidelines. 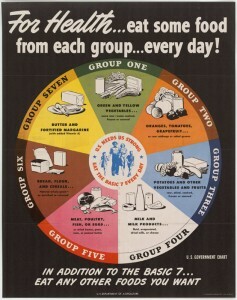 It’s a USDA food wheel from the early 1940s. With Twitter-like style, it says: “For Health…eat some food from each group…every day! The details are rich: “butter and fortified margarine” constitute 1of the 7 groups. Further inspection-worthy, IMO. I love the last line “eat any other foods you want”. Zowie, cream puffs, jelly donuts, choc fudge ice cream, here I come. OT, Dr. Elaine, are you by any chance watching the Dr. Conrad Murray, Michael Jackson trial? 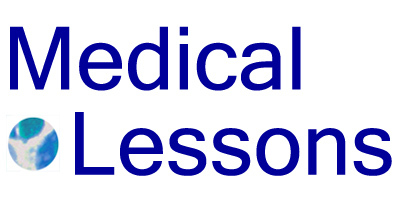 If so, I was wondering your opinion of the medical and ‘expert’ witnesses presented. Personally, I was very impressed with the 2 (lady) UCLA physicians who tended to Jackson upon his arrival in the ER the day he died. Hi Emily, The poster’s fascinating, I agree. About the trial, I find it saddening and so haven’t watched much except for occasional snippets on CNN.